GTRI is a Consulting Solutions Integrator with a broad range of information technology expertise serving enterprise, federal and state government, healthcare, educational, and other markets nationwide. Our core practice areas of expertise include Physical Infrastructure, Integrated Solutions, and Network Monitoring & Management. 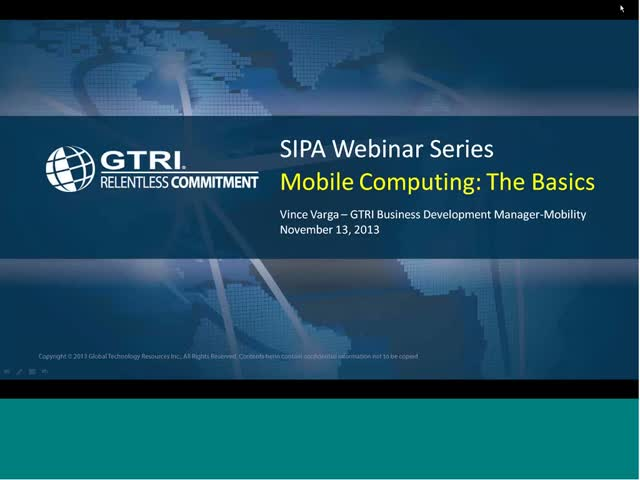 Webinar hosted by VInce Varga, Mobility BDM at GTRI. Video and animated demo showing Juniper's Simply Connected secure guest access solution, presented by Abner Germanow. Video and animated demo showing Juniper's Simply Connected bring your own device (BYOD) solution, presented by Tom Clavel. In the past two years we have seen a paradigmatic shift on nature of the cyber threats industry is facing. We are now well beyond the days of hackers, breaches and perimeter defense. Today the sort of ultra sophisticated, multi dimensional attacks that were confined to governments and the Defense Industrial Base just a few years ago are in evidence far more broadly. The attackers we need to be concerned with are not script kiddies "hacktavists" (although they are still around) Our greater concern is with well organized, well funded, very sophisticated and probably stated supported attackers who will compromise any system they target. This does not mean we have no defense, but rather that we need to rethink defense both at an enterprise and government level. Some enterprises, and some policy makers are realizing this advanced threat will require a new more incentive based approach to cyber defense, however some are unfortunately clinging to outdated models that could do more harm than good. This webinar will examine all these topics. Video and animated demo showing Juniper's Simply Connected high availability solution, presented by Tom Clavel. Its time to build the better network - design it right the first time! How to build the best network for the Healthcare Environment from step one!